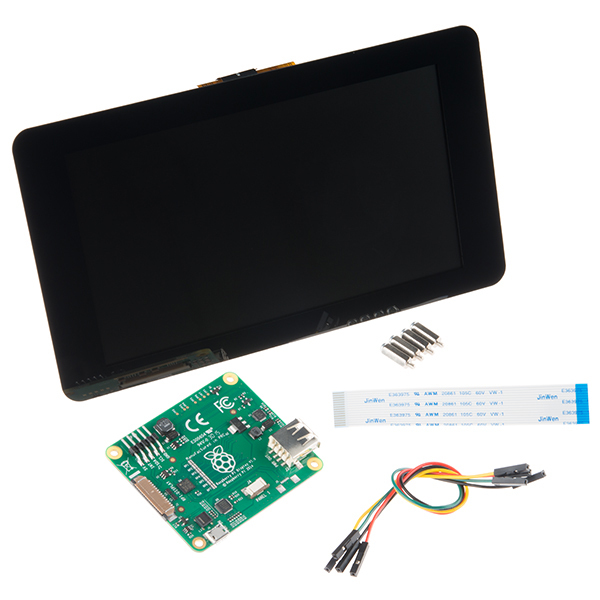 This 7" Raspberry Pi Touchscreen LCD provides you with the ability to create a standalone device that can be utilized as a custom tablet or an all-in-one interactive interface for a future project using your Raspberry Pi 3. 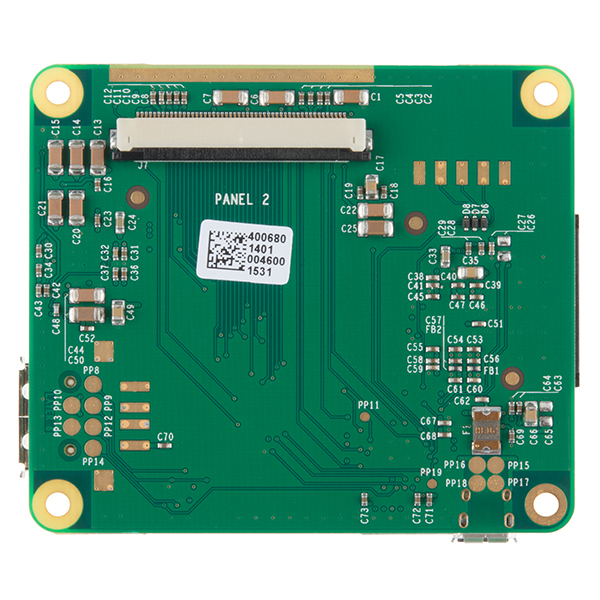 Each LCD features a full color 800 x 480 capacitive touch display that connects to the Pi via an included adapter board which handles all of your power and signal conversion needs. An updated version of Raspbian OS on the A+, B+ and Pi2B is required for the display to work (the display does not work with the current version of Raspbian available on the Model A or B). What makes this LCD great is the fact that it only requires two connections to be hooked up to the Pi; power from the Pi’s GPIO port and a ribbon cable that connects to the DSI port present on all Raspberry Pi's. Touchscreen drivers with support for 10-finger touch and an on-screen keyboard allow you to use your Raspberry Pi without an external keyboard or mouse. Instructions for updating NOOBS to enable the Pi LCD. Format your card on a computer to get it ready for NOOBS. If you have Windows, use this SD card format utility https://www.sdcard.org/downloads/formatter_4/eula_windows/SDFormatterv4.zip to prepare the card for use. If you have a Mac, the OS X Disk Utility is also capable of formatting the card. To do this, select the SD card volume and choose Erase with MS-DOS format. After the card has been prepared, unzip the NOOBS files you downloaded earlier to the card. Now remove the card from your computer and insert it in your Raspberry Pi. Plug in an HDMI monitor keyboard an mouse. Power the Pi and follow the prompts to install NOOBS. After installation is complete, shutdown and power the Pi off. Remove the HDMI monitor and reapply power. Your Pi LCD should now be working. Connect your Pi to the internet via either the Ethernet jack, or WiFi. Open a terminal window in the GUI. The Pi will download the necessary files it needs to update. This may take a while depending on your internet speed. The updates will take a while to install. Give it time while it does it’s thing. Version difference on the screens, possible issues with older NOOBs images. Previous screens had a version 1.0 controller board and the newer (pre assembled) ones have version 1.1 boards. Older versions of NOOBS DO NOT WORK with the newer screens even if they worked with the older 1.0 screens. Running 'sudo apt-get update' and 'sudo apt-get upgrade' will update an older card and enable the newer screens though. NOOBS 1.7.0 also works out of the box. You will need a HDMI monitor OR SSH in remotely to do the upgrade procedure because the screen won't work until after it completes. Nothing displaying on the screen? 5.) Traces on the ribbon cable have been pulled. Try looking at your connections and do not jam the wires into the connectors. In one case, a customer had jammed the cable into the connector so a trace was not connecting properly. The 'for scale' objects in the 3D viewer aren't the right size. Probably a units mismatch. Please correct so the Mars Climate Orbiter will not have crashed in vain. 3.) Your power supply to power the LCD (5V/1A worked fine but the specs recommend 5V/1.8A). If your power supply is 5V/2A and powering the Raspberry Pi, you can also use the power from the 5V and GND GPIO pins. What are the dimensions of the display, mounting holes and bezel? This information is strangely absent. I didn't see it in the store, but do you also sell replacement DSI Ribbon Cables? Does this have an integrated backlight? It isn't specified and is critical to the application I have in mind. If so, can the description be modified to include this bit of info? 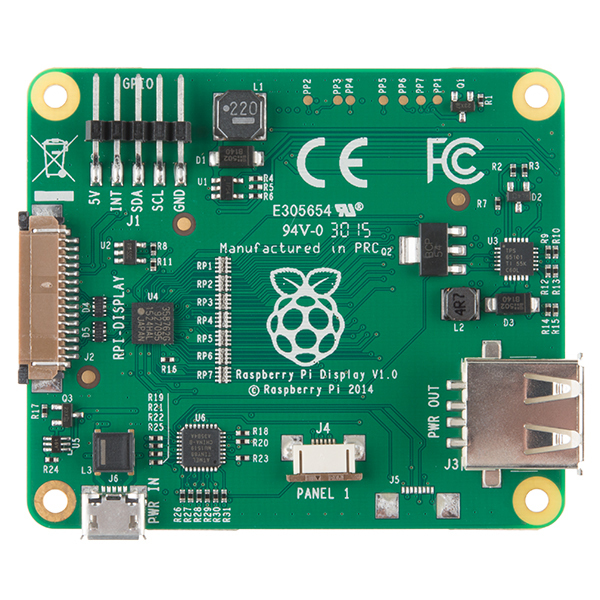 Will it work on a Pi2 running Ubuntu Mate or only Raspbian? Does any one know if this will work for the pcDuino 3? from the description, this is Raspbian only? 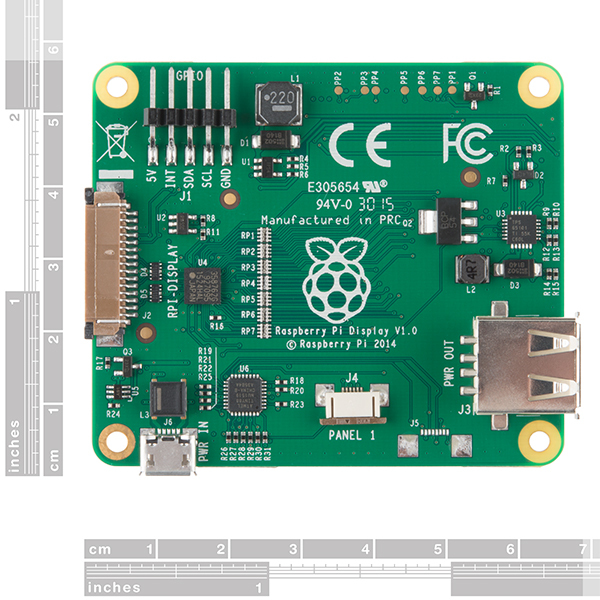 will this work with Windows IoT Core on RaspberryPi2? i got it to work, but i have the windows insider one. it also works with retropie but the touch doesnt work. I was not able to get it to work with windows IoT (non insider version) out of the box. There wasn't much information on how to get it working at the time (about a month ago) last I searched (1 month ago). You need to have Raspbian Jessie to properly use this display. Wheezy might work but it's not supported. I've had pretty good success with a portable USB charger (i.e. a battery with a USB-A port). Anker is the best brand I've come across. And thanks, rEgLer, for the 1A tip. Any of the powerCore series I've seen supply at least 2A per port. I'd suggest you buy a tablet. $60 gets a lot of tablet these days. Lots of ways to hook up any misc hardware via the USB port. In the end it will be a better screen, faster machine and more portable. My setup with a Raspberry Pi 2 and the screen consumes about 1A @ 5Vdc. You would need a large battery and boost-buck voltage regulator to truly make it portable. This was easy to install and it looks good. The Touchscreen is responsive and clear, but you might want to use a stylus. The only issue i had is finding a case for it. You'll want to get one right away, unless you have a 3D printer to make one yourself. The screen is really thin, so I didn't want to carry it around without some protection. Overall, it's a great touchscreen, especially for the price, and I like that it is Raspi-branded. I'm using it to run a lighting and irrigation system for my house. The color graphical interface allows me to use BMP images of my house and yard for control screens, and its built into an enclosure set into the wall for a slick professional look. I even put an access from the backside of the wall for wiring it without having to remove the Pi or the touchscreen. 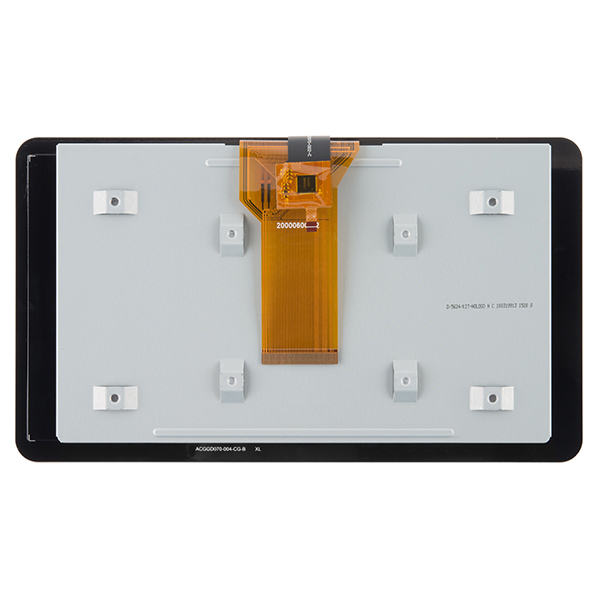 Great responsiveness, inexpensive, can't beat 10-finger multi touch! The python demos are really neat, too. Only gripe is that the screen isn't oleophobic, but for the price I'll take it! Awesome screen - works great with Windows IoT Core. Very nice, crisp and bright screen. Works with Windows IoT Core v10.0.14366.0 developer preview - quite stable. I purchased 5 touchscreen. Two before and three in January. Touch and display quality is superb. After two-three month of use (no rough use; handled with care), display LCD and front touchpanel (black bezel) break apart. They both are connected using a thin double sided tape. I was planning to use in industrial environment but after such issue, I dropped my plan to use it in industrial environment. Five of two displays are not in good condition. First display's touch-panel and display LCD was break apart after two-three month. The second among five displays had another issue. Display LCD was mounted slightly right side of the touchpanel. Once you power-up display, it is easily be seen that LCD panel was a bit off-side. The other display's screen guard having so many scratches on them which seems mishandling. Since I'm living outside of USA, it is not feasible to get replacement of the display as it is much costly to send it back via courier. I expected quality displays from Raspberry Pi Foundation. I hope, they will improve their display quality as well as handling mechanism. Freaking awesome display for embedded projects!!! This screen worked right out of the box! Touch worked great with my new pi 3! However aside how fragile the (non functional) edges are, the only real issue I see is upon shutdown of the pi... The screen goes through a series of screen washes/whiteouts and never really shuts off.. I have to pull power to get it to turn off.. I've even tried usb/provided jumper wires.. And both results in the same thing. Not sure if this an issue per se, but it is bothersome.. I can just turn the unit off, I need to unplug it too.. I purchased this to tinker with. So far, all is going well. I am using Raspberry Pi 3. The display came up with no problems. I am just waiting for the Smarti Pi Touch enclosure (pre-ordered after the Kickstarter project closed) before continuing to work with it. Quite a good little screen! Basically, it 'does what it says on the tin'. It's bright, relatively responsive and has acceptable color. Haven't played much with the touch screen part of it yet, but very pleased so far! The only question(s) that I have are regarding what sort of additional processor power is inside the screen, and whether powering it from the micro-usb connection whilst also bridged from the RPi3 is an issue (it hasn't hurt anything, yet!). Not perfect but quite nice. Pros: Easy to connect - after watching the video. Nice that a mouse and my fingers can both be used at the same time. Sharp text is usable even when tiny in size. Colors seem bright and saturated. Nice that I can control the backlight via software - since I am using it as an alarm clock screen and need a very dim display at night. Cons: Some "bleed through" - if that is the correct term - of light when the screen is black. No convenient mounting points - like a screw hole in each corner, or similar. I still haven't figured out a good way to mount it in a non-standard box. Somewhat limited in viewing angle. Brightness falls off unless looking dead on. I WAS DISAPOINTED THAT THE UNIT DISPLAYS EVERYTHING UPSIDE DOWN. I HAD TO USE THE LCD_ROTATE=2 COMMAND IN CONFIG.TXT TO FIX IT. THE INITIAL BOOT IS STILL UPSIDE DOWN BUT I GUESS AFTER IT READ THE CONFIG.TXT, IT FLIPS. SHOULDN'T IT COME STANDARD RIGHT SIDE UP? Hmmm, it should, and this isn't an issue we've seen before. I would suggest getting in touch with our Tech Support team, they should be able to help you out. Great addition to the Raspberry Pi. Pros: Excellent quality screen. Easy to assemble. Notes: Purchase or build an enclosure. This thing is a little fragile to exist on its own outside of some sort of enclosure. Works like great. I also bought the case Which I love except you can not get to the SD card once it build. I use a small wireless keyboard so it nice combo. I Can Throw it in my back pack when I go to work too. This allow me more time to play with it. With so many, phone and tablets that have hi res screens, this is disappointing. It does what it's supposed to, but has a retro look. Non techy relatives are not impressed. The must annoying feature is the bright white screen when it loses signal as the OS shuts down. The touch input is inconsistent as input. I was using the I2C for a device was not able to get it going on the alternate I2C, but fortunately the required clock and data are on the DSI cable ... wasted hours finding that out. An OLED display, higher res, and lower current draw would be really nice in the next version. It's OK for embedded using a custom case but the low end case for desktop is awful. The injection molded ones are much better. I forgot to check that this LCD touchscreen don't have a case. Much better that you have a notification (e.g. recommending the user to purchase also a case) when purchasing this kind of product. But thank you for this product, I will purchase again soon. The only minor drawback that everyone should be aware (which is to be expected, honestly) is that the display draws quite a noticeable amount of current. The SmartiPi case comes with an splitter USB cable for the power source, but if you expect to use that, be prepared with a (very) beefy power supply, else you'll get the thunder icon on the screen all the time and a very reduced performance (Just discovered that the RPi3 reduces its own clock when power is low). I currently power this with a separate 1.5Amp supply for the screen and a 2Amp supply for the RPi3 and everything works just nice. This totals to a whopping 3.5A, which may be overkill, but keep that in mind as a reference. Otherwise, I'm enjoying myself so much with this portable Retropie jig that I wish I didn't have a full time job. I received this touchscreen on time and in perfect condition. I quite recommend SparkFun. I am impressed with this screen, I also got the mating case (SmartPi Touch) and it assembled nicely. With the separate case, the included jumpers and cable are not needed. The PCB was already attached with the standoffs. The packaging was super! The screen is slightly larger than 7 inches. I measured it as 7 5/8" wide X 4 3/8 high with a diagonal measurement of 8 9/16. Works very well, but I haven't found reliable instructions. Internet search turns up lots of hits, mostly unreliable. Doesn't work with the OSMC I have, and I haven't had time to track down the problem. Didn't find anything in the official blogs. Nice and crisp screen. Very responsive. I have no complaints. 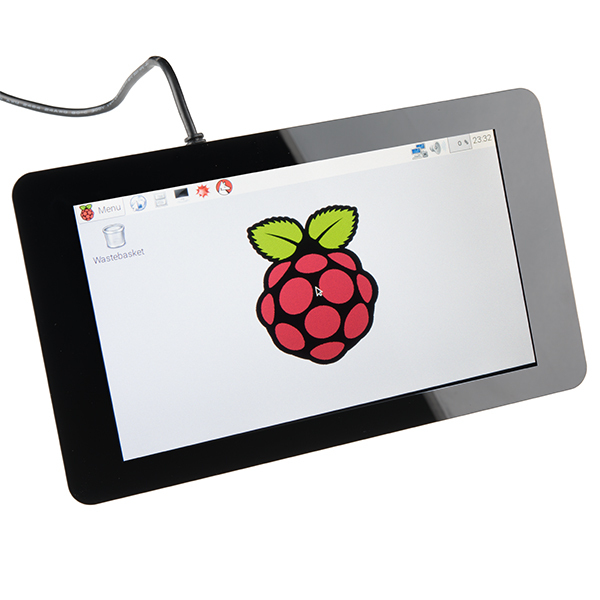 This official Raspberry Pi 7" touchscreens now come with the display controller already connected and mounted to the back of the display. You still need to be careful pulling forward the small black tab ends that connect a ribbon cable to the RPi. Review the SparkFun documentation before assembling. I bought the companion enclosure as well. This Touchscreen works exactly as described. I am very pleased with the display. I ended up using a mouse anyway as the icons (while clear are very tiny) and selection areas are a bit small for fat fingers. I connected it to a Raspberry Pi 3 B running Stretch and it seems to be working perfectly. I had been previously driving a VGA monitor from HDMI through an adapter. The RPI 7" screen started up just fine without changing or installing anything with the OS. I'll be using this as a home automation/weather station display; looks like it'll work great. It gets rid of a full sized monitor, which is great.. I gave a full system to my grandson for Christmas. After we put it together, his first question was, can I use it for home work?. All I need for it now is a Ups type battery charger for 5volts. It,s now sitting proudly on my aircraft instrument panel. I have tried other touch screens for the Raspberry Pi. They had complicated assembly and were very difficult to get them to work. This unit was easy to install and get working, is very nice looking. I am very Happy with it. Its very useful for my project, because i can see the parameters (like temperature, humidity and other more). The first touchscreen has a problem (dead pixels), and Sparkfun send me a new replace. Really thanks for this help. Right out of the box it worked. Didn't even have to do anything to the RPi (in fact, both were taken out of the box at the same time, connected, and worked on the first power up). Screen quality is good for price. Also ordered the "SmartPi Touch" case which holds everything together very nicely. Ordered it, a Raspberry Pi 3 B+, and a power supply. (Had a mouse, keyboard, and uSD on hand.). It came a couple of days ago, and I put together yesterday. Had noticed in the documentation that there's a micro USB power input, and a standard USB output. In the configuration where the power supply is plugged directly into the Pi and the LCD interface is powered via a USB cable plugged into one of the Pi's USB ports to the LCD's micro USB, the LCD won't light up at all. When the power supply is plugged into the LCD controller board and the USB cable connects power to the Pi, I get "low voltage" warnings (yellow "lightning bold"). When I use the provided F/F jumpers, it works fine, but this will cause problems plugging in other "hats", as well as clearance problems. (In my application, separate power supplies would be a BIG PROBLEM.) BTW, I checked with two different USB cables, and got the same problems as well as when I tried an Adafruit 5.25V power supply. (I was about to try a second RPi3B+ when the original one stopped booting. Fortunately I had another that I'd been using as a "pass-around" sample at talks, and fortunately when I tried it, it still worked, so now the "dead" one will be passed around!) Also, it could prove really useful to know what size those mounting screws are in case they get lost! Ace Hardware recently opened a new store about half a mile from my house! Screen looks great and very responsive to touch. I love how the Pi mounts to the back. I got it working the first try, easy to follow instructions. Trying to learn Kivy with Python for touch screen programming, That's a lot more difficult. It's bright, clear, good color rendition. Touch input is responsive and accurate. Trivial to assemble and get going. Like the multiple power options. Would buy again. Overall, very good product. Works as intended. Works great. Easy to hook up and configure. The only drawback is that I wish there was a case I could purchase for it. I have seen 3D files for printing your own, but I do not have a 3D printer (yet).